A sink of depravity and treachery, where those in power oppress their subordinates while appearing to work together until active betrayal becomes a viable path to power. Thankfully, pretty much internal to the aboleths. Master of the outpost (most powerful aboleth here) wants to gain power to challenge the powers that be in the Aboleth Conclave. Two of the master’s three lieutenants are building power to overthrow the master. An alliance of dubious value with a powerful being that will betray you without hesitation if that would suit its purpose. Hidden knowledge and lost treasures, if a deal can be made. 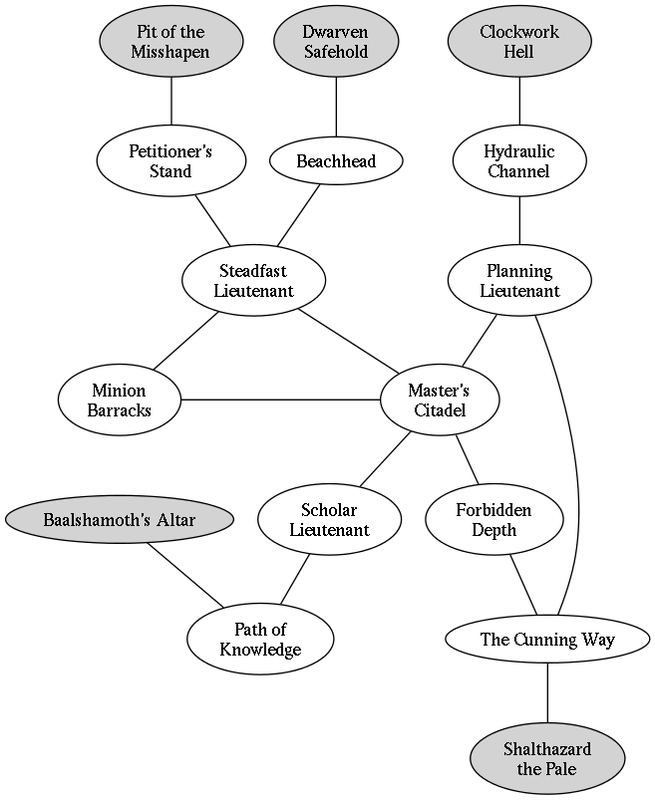 One lieutenant is trying to establish a power base by making use of the Fane of Baalshamoth. Same lieutenant has met and dealt with Aristothanes, to their mutual benefit. Another lieutenant is trying to build an alliance with Shalthazard the Pale. The Pit of the Misshapen has a path that leads to the Aboleth Conclave Outpost. The Clockwork Hell draws on the waters of the Aboleth Conclave Output for its hydraulic systems. This may be related to the Clockwork Hell’s mechanical failures. The Dwarven Safehold was established in part to monitor and observe this Outpost. An unlit underground lake with strange ripples and perturbations on the surface. The water here is somewhat more viscous than normal because of the accumulated aboleth mucus, and drinking it is distinctly unpleasant. Deep below the Abandoned Tower. Given the relative ease of moving through and on the lake (as opposed to the massive amounts of stone above it) the paths below represent either links to regions outside the Aboleth Conclave Outpost or commonly-traveled paths within the Outpost. There are many aboleth lairs around the Outpost as a whole, plus other unpleasant surprises for those who poke around. The places listed below are merely some of the highlights. Petitioner’s Stand: Foreigners trying to establish contact with the aboleths (typically) start here. Beachhead: Dwarven scouts and observers generally come here (and would probably be happy to learn of alternatives such as Petitioner’s Stand and the Hydraulic Channel). Hydraulic Channel: Clockwork Hell draws on this lake for its hydraulic systems; it may be possible to use this to travel between the regions. Steadfast Lieutenant: This lieutenant is loyal to the Conclave and will support the Master as long as the Master acts in a manner loyal to the Conclave himself… and only that long. Planning Lieutenant: This lieutenant is not as loyal to the Master or the Conclave but is biding his time until a bid for power is likely to be successful. He is responsible for advising the master on current events and future projections so the Master can decide what to do. Scholar Lieutenant: This lieutenant is not as loyal to the Master or the Conclave but does not wish to draw attention; he will support (and manipulate) whoever acts as Master. Minion Barracks: the military forces of the Aboleth Conclave Outpost, such as they are, are centered here. This are typically enslaved humanoids and other creatures, led by lesser aboleths from the Outpost. Forbidden Depth: An immense sinkhole near the Master’s Citadel. The Master ‘invites’ those who displease him to explore it’s depths. None have returned. The Cunning Way: A secret (or ‘secret’) subterranean waterway that leads to the lair of Shalthazard the Pale. Path of Knowledge: A secret (or ‘secret’) subterranean waterway leading to Baalshamoth’s Altar. Pingback: Node-Based Megadungeon: Clockwork Hell | Keith Davies — In My Campaign - Keith's thoughts on RPG design and play. Pingback: Node-Based Megadungeon: Dwarven Safehold | Keith Davies — In My Campaign - Keith's thoughts on RPG design and play. It is entirely possible that a group of players could show up, do just what they want to, and leave. Honestly, to me, that’s kind of awesome good. It demonstrates that they have agency, and that their decisions actually made a difference. If, for example, they were after Shalthazard the Pale and managed to take a shortcut (Abandoned Tower to Clockwork Hell down to the Aboleth Conclave Outpost and then the dragon’s lair), I would be rather more impressed than annoyed. As it stands, so far I’ve spent perhaps 12 hours on development, and about six talking about it. If the players used “only” those four nodes and spent only one session each, I’ve still spent three hours per session on prep. That’s roughly equal time prep and play, which is higher than I like but not horrible… and none of it is truly wasted. Quantum Ogre be damned, I like the relationship I’ve devised between the wolves and the goblins, that can be lifted straight into another adventure. Aristothanes’ Sanctum and Baalshamoth’s Altar can be jacked into another adventure too (possibly modified, since I’d likely want to disconnect from Clockwork Hell). In fact, not only would I be impressed, the players would likely be well-rewarded for it. I wouldn’t do this in a sandbox campaign, but in my normal campaign experience is gained by completing story elements. Pretending that “defeat Shalthazard” is projected to be a four-level adventure, if the PCs manage to ninja their way down there and kill him, I have no problem giving them the full experience gain and let them jump four levels. They certainly deserve it, that would be a hard way to go about it. There is also nothing that says that a later adventure or campaign can’t revisit this particular dungeon allowing reuse of the work without any Quantum Ogre issues. Perhaps they need to deal with the Dwarven Kingdom and are going to use their previous disruption of the Aboleth Outpost to get an in by way of the Safehold. The way you’ve done things would even make it easy to work through the impact of the player’s actions the first time they went through the place. Which they are aware of because of interactions with researchers in the Clockwork Hell. A good point, Chakat, and one I should have mentioned. Thanks. This is another argument that this can be a good mechanism, for sandboxes in general and especially for something like a West Marches-style sandbox where multiple groups might come tromping through. Pingback: Node-Based Megadungeon: Pit of the Misshapen | Keith Davies — In My Campaign - Keith's thoughts on RPG design and play.